Self-driving cars might be just around the corner (or in reality many decades away), so what are you supposed to do in the event of a crash when everyone’s just sitting in the car and chatting conference room-style? Ford is trying to stay ahead of the game and has come up with a variety of patents for that, like an astronaut suit and a giant airbag burrito. A set of patent applications filed last week show multiple ways that airbags can be used in the future especially when it comes to the conference room style seating scenario. In those cases when the passengers are seated facing each other, traditional airbags deployed from a steering wheel or dashboard would not work so it appears that they are trying out some new ideas. The first patent application describes a seat assembly that includes a collar that is put over the passenger and either zipped or clasped on. A hilarious-looking airbag that is installed inside the collar would deploy in case of an accident and cover the heat and neck of the passenger in a helmet-like fashion. This appears to mimic a configuration similar to what you might see a race car driver wear with head and neck protection included. 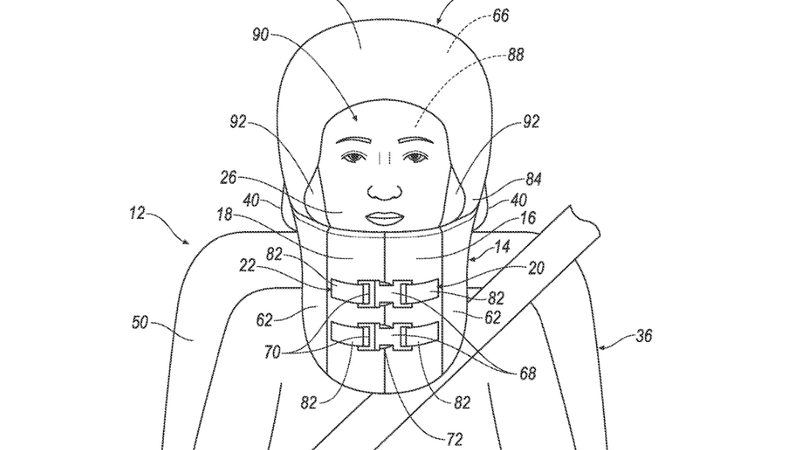 Based on the description in the patent application, it appears that Ford intendeds for these collars to be permanently installed as part of the seat and put on by the passenger each time they enter the car. It is a stretch to even see private owners using these, but I am very reluctant to believe that a rideshare customer would put this on considering how unhygienic they could become after thousands of uses. It’s hard to even approach this one with a straight face. Why would they design a rearward facing seat if it still required an airbag. Maybe Ford is planning to use these in demolition derbies which usually involve accelerating violently in reverse? Hygiene might be why Ford filed another patent that doesn’t require placing the the safety device on your skin and appear to look more like an airbag burrito or igloo. This patent is similar to the first one as it attempts to make swiveling seats safer and it works by releasing an airbag from the seat the provides for impact protection for the passenger on each side. Even so, unless the car is the size of an RV, I don’t see how the airbag could actually fit inside of the cabin or safely fit a person inside of it. This type of airbag would be installed in a similar fashion to current seat mounted airbags but instead of coming out of the side of the seat it would deploy out of the front. This design seems a little more feasible than the first one but I find both unlikely to be put into production anytime soon. At least Ford is moving beyond just the wacky concepts and thinking about the safety aspects as well. Who is getting paid to make these crazy Ford patents?